brokenclay.org/journal > Life with a Disability > Goofy Stories > It’s a Jeep Thing? Requested an “intermediate SUV”. 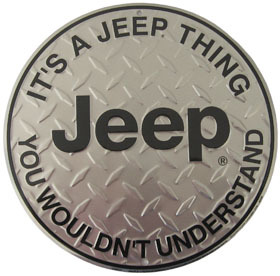 Got a Jeep Wrangler, billed as a “full size, all terrain vehicle”, no extra charge (surprise!). Let’s see – way too high for (most) wheelchair users to get into, no way (that we could find) to adjust the side mirrors, made a constant whistling noise as the wind found its way through the fabric top into the vehicle, got terrible gas mileage – this was an upgrade how? You’re right – I don’t understand.